Make your move in the 2005 Goodwill Rengo, to celebrate peace and ecology, both in our planet Earth and in our minds! Quicksilvre: Aw man, I wasn't even paying attention to who I was playing for. My fault. minue622 : I have added my name right now. So, I can take a part in playing this rengo game from now? 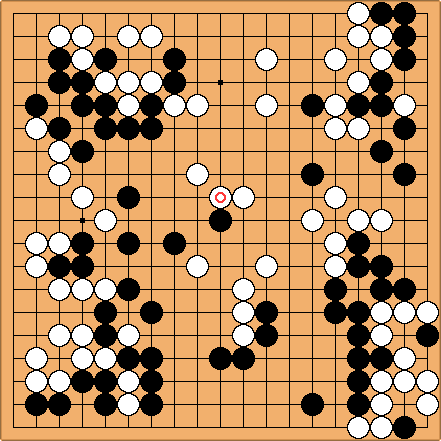 And...can I add my move on new go-ban? dnerra: Sure, just go ahead! DJ : Seems to me Black is way behind... Let's close the game with a flourish. 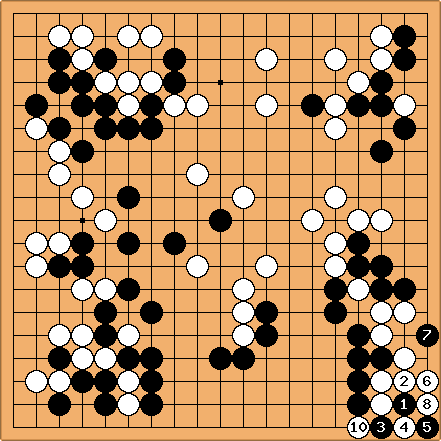 The swap in the LR corner was too costly: it is true that there was a lot of aji, but maybe White had too easy a life. Why don't we analyse the position in the Discussion? jwaytogo : Ever-faithful to the Herons, I like this move as it has some rather nice follow-ups, and it should swallow the stone played earlier. DJ: wasn't expecting to connect to the right, but was played bearing in mind the proverb Make A Feint To The East While Attacking In The West: I tried the (vain) hope to break in from the left using it as a bait. Now that dnerra has closed the last door, I think Black should just resign. dnerra: How about the following: everybody counts, and posts his result on a separate page (before looking at other people's answers). Then we take the median of all answers as komi, and split the teams so that everybody who sees White more ahead than the median gets to play white. Should be a great endgame exercise! Rich: counts W+27 (+0.5 to persuade me). kokiri: - reading? who needs reading? DJ: Ah, the beauty of rengo! I am afraid stubborn play led Black to a loss... Trying to limit the damage. dnerra: , Completing the nice work of my team mates. crux , we're winning, aren't we? Dieter: I agree with but not with the precedent of playing three moves in a row. What is obvious to you may not be for other players, be they weaker or stronger. minue622: . Time to kill. Shaydwyrm: , I say it lives. Mef: , I too usually don't like to play 2 moves in a row, but since this response is automatic (any other move and white lives), I'll play it..
LukeNine45: , I guess white can live here after all. Dieter: . Somehow I'm getting all the moves 1 mod 10.
dnerra: -- pop quiz part 2. Velobici: -- quiz answer ? Gul: -- Long live the empty triangles. kokiri - what's going on? DJ : Ok, let's slow down and recover from the frenziness. I'm gettin older and my heart seems weaker... Making shape? kokiri : sooner or later white's gonna have to make some territory. PurpleHaze: , reducing said territory. dnerra: . Slow but I don't want to leave cutting aji around here. JoelR: . A third White move here would give them too good shape. crux: . Don't want Black to have this point. Velobici: . Draw back once. Gain liberties. JoelR: . End of the road. Velobici: . Make eyes. End ko that never really got started. Velobici: . Extend from an important stone. JoelR: . I feel there's aji on the left (and I don't know how to continue on top). Dieter: removing the aji of the cut. minue622: Althogh seems to be a mad move, I believe this is the only move to make a chance of winning. Mamma mia, isn't all this a bit too freaking??!? dnerra: . Peep where you cannot cut. minue622: . Empty triangle. I love it. By the way, White's move 50 was really good, I think. JoelR: No B 2 bombers here! kokiri , swashbuckling tenuki, kikashi, or just plain rubbish? Joelr: , faithful to . DJ : Moyo? What Moyo??!? Do you mean the White one on top? I think playing a would be submissive, starting a fight around bcould be dangerous (you never know, what if White gets even stronger toward the top? Our poor little black group on the TL could suffer...). JoelR: . 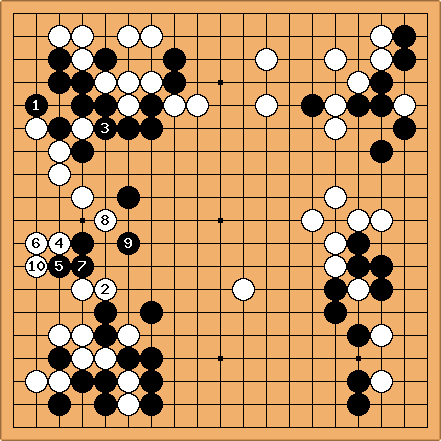 White's move makes the upper left scary. Let's see how this shakes out. jantiff: attacks and builds the top. minue622: : Hoping to make base in corner. By the way, I wanted to play in white's position, but nobody seems to continue to play black's move. I can't wait anymore. crux: : Adventure, excitement, and Really Wild Things. JoelR: . not to get shut in. jantiff: is the only move. Shaydwyrm: , my best guess for a good extension, channeling Yilun Yang's advice. jantiff: , can't allow ponnuki. JoelR: White's forcing moves hurt least this way. dnerra: . Let's test them. 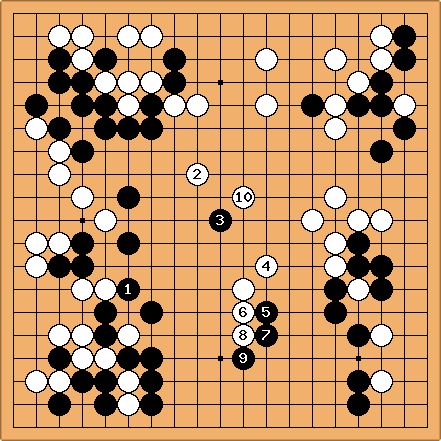 Jakub: , A joseki move. 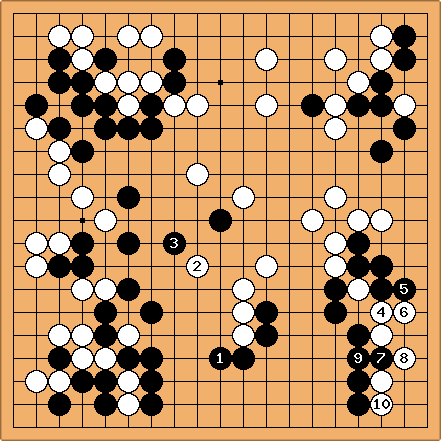 PurpleHaze: , still more joseki. dnerra: . Don't want to start a fight here. Shaydwyrm: , I'm ok with that. PurpleHaze: , gaining liberties, forced I believe. JoelR: . I don't think Black lives on the right without this capture. Arno: . Harass the two black stones in the corner (while extending our base), now that we have a strong ponnuki down the side. Jakub: . 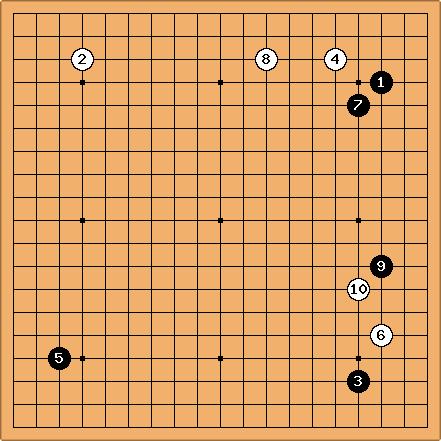 Either making or preventing shimari is always big, and looking at the whole board, approaching here seems wiser than enclosing the northwest corner. 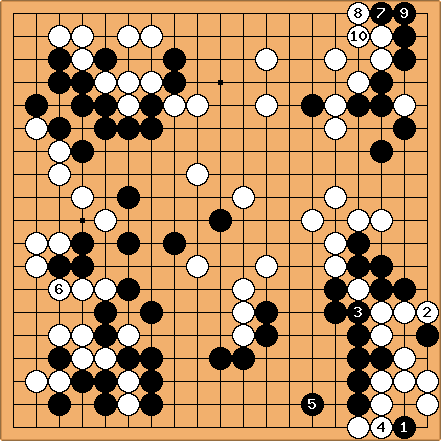 Looking over the most common joseki, a high approach seems preferable. PurpleHaze: , this pincer seems the right direction. kokiri - , I'm not feeling very imaginative today, but it is my birthday. JoelR: . Happy birthday. Is it still 2004 where you are? Jakub: , the joseki move. But Black can get a nice framework now. Quicksilvre: , building said moyo. Jakub: , With a lovely cutting point. JoelR: , only a few more days of noggy goodness before the government takes it all away. Velobici: , does White have a prayer? Strengthen the weakest White stone. JoelR: , there will be some sort of trade here. An exchange of gifts, perhaps? DJ: , in the wake of tradition. IanDavis: , in the name of overplay. Hikaru79: , in the spirit of co-operation. Velobici: combination pincer / extension. Quicksilvre: Reaching upward. In the spirit of beginners! Probably a bad move.